Hardy perennial herb with green leaves that are shaped like barbed spears. It can grow up to 15-30cm and bears small inconspicuous greenish flowers that turn brown as the fruit ripens. It likes acid soil in full sun to partial shade. Can get invasive - add a few applications of lime to eradicate it. Good low-growing evergreen container plant. The young leaves have a lemony, tangy tart flavor. Use as a garnish, a tart flavoring agent, a salad green and as a curdling agent for cheese. Use sparingly in soups, omelets and fish sauces. Pick young leaves throughout the growing season to use fresh. The leaves do not dry well - can be freezed. Sorrel acetosella contains constituents including beta carotene, tartaric acid and oxalic acid and has traditionally been used to treat inflammation, cancer, diarrhea, scurvy and fever. A tea made from the stem and leaves can be made to act as a diuretic. 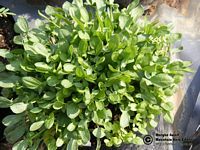 The entire plant, including the root, is used as a cancer treatment and is a primary ingredient in a preparation commonly referred to by the name Essiac tea. Good vermifuge against intestinal worms and a remedy for stomach hemorrhage and profuse menstruation. It should not be used medicinally by sufferers of rheumatism, arthritis, gout, kidney stones or gastric hyperacidity. Extract juice from the leaves to remove rust, mould and ink stains from linen, wicker and silver.